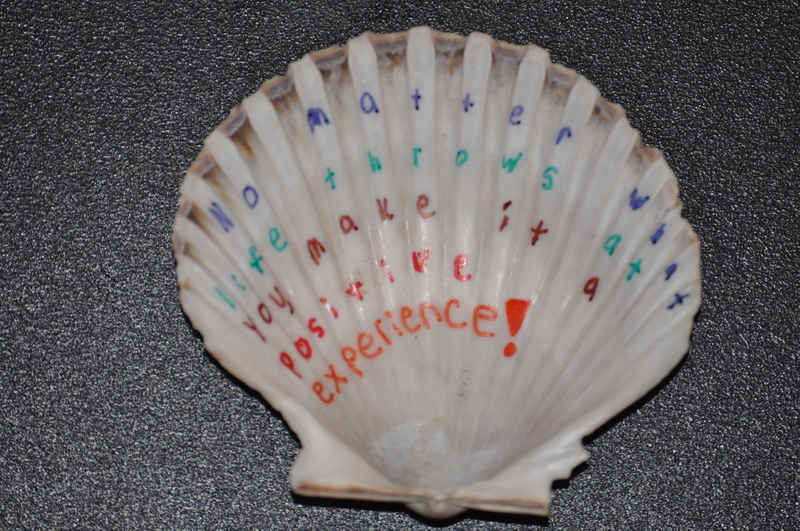 No matter what life throws at you make it a positive experience. Home / Adviart Blog / No matter what life throws at you make it a positive experience. No matter what life throws at you make it a positive experience. This adviarter picked a shell and decided to write on the back because of its open surface. The advice is that no matter what like throws at you make it a positive experience. The adviarter used the spine of the shell for the letters and mixed up colors along the way to make his point clearly. As the words go down the shell, the size of the type gets larger and larger. This adviart has come in handy many times since receiving this shell. Most notably, this adviart directly aligns with my thoughts on this adviarter. The positivity in this adviarter is one of the adviarter’s best assets. Perspective is everything and in every experience we can choose to be positive. How do we look at experiences only in a positive light? Better yet, how do we ensure that we see a positive in each experience? Might that require discipline?